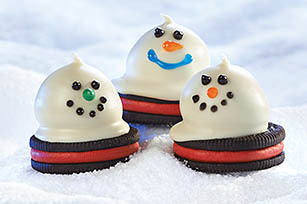 Make delicious Melting Snowman OREO Balls this season! These cheerful no-bake snowman OREO balls on top of festive cookies will brighten any winter day. Finely crush 9 cookies. Mix cream cheese and cookie crumbs until blended. Roll into 15 balls. Place remaining cookies on waxed paper-lined rimmed baking sheet. Dip balls in chocolate; place on cookies. Tap cookies on tray 3 to 4 times, allowing excess chocolate to pool onto cookies. Decorate with gels. Use a toothpick to dip the cookie balls into melted white chocolate; shake off excess chocolate then place on remaining cookies.